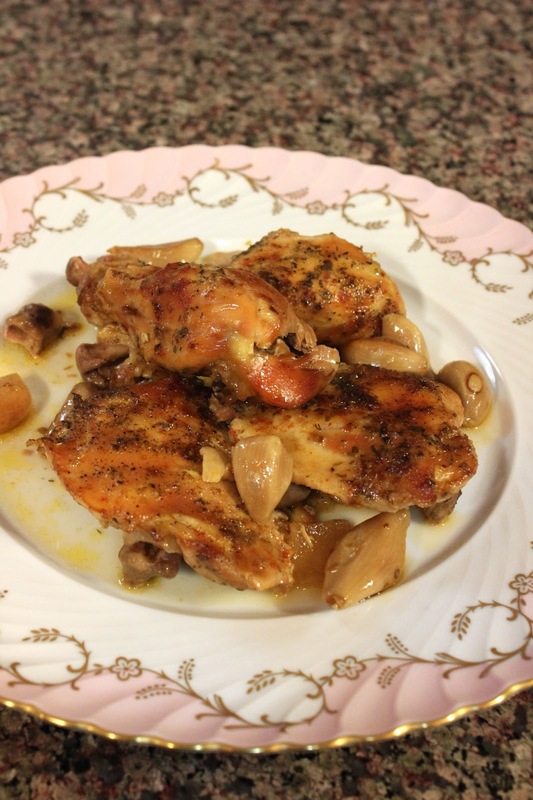 In winter, we eat chicken with garlic. Note: This recipe is super easy when you buy one of those huge containers of peeled garlic cloves from Costco (or whichever big-box store you frequent). Chicken. Garlic. Oven. What else do you need? Heat the oven to 450 degrees. Spray a large roasting pan with nonstick cooking spray.Lay the chicken pieces in the pan, skin side up. Sprinkle them with the dried herb mix and scatter the garlic cloves around them. Cut the lemon in half and squeeze the juice over the chicken. Put the lemon halves in the roasting pan. Drizzle the chicken with the olive oil, then shower it generously with salt and pepper.Turn the chicken pieces over so the skin side is down. Put the roasting pan in the oven. Set the timer for 15 minutes. (This step crisps the skin. )After 15 minutes, turn the heat down to 350 degrees. Bake another 40 minutes or until the chicken thighs are cooked through and very tender.Serve the chicken skin side up with the garlic cloves and pan juices poured over. This will be delicious! I LOVE the taste of cooked garlic both for the chicken and to eat almost as a vegetable. Thanks for a great idea.